DENVER -- An EpiPen can be a life-saver during a severe allergic reaction, but what if the pharmacy sells you expired ones? That is what happened to an Aurora mother, who reached out to Contact7 to alert other parents of the potential risk. 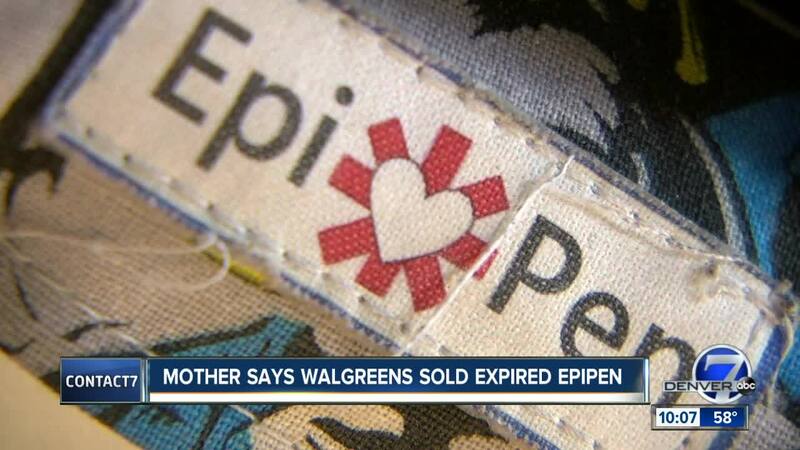 Now, Walgreens is apologizing, saying this event is rare. This week, Debra Smith got a call from her 11-year-old son's school nurse saying his EpiPen, the one Smith bought from the Walgreens at 20051 E. Smoky Hill Rd. in Centennial on February 15, had actually expired last November, three months before she bought it. "There is no guarantee that the expired medication beyond the date would work for him and then he could have died," said Smith, who said her son has had a severe anaphylactic episode before. Contact7 reached out to Walgreens, which released a statement apologizing, stating, "We have reviewed the process with our pharmacy staff to prevent this from happening again." Last Summer, the FDA said people could use some expired EpiPens for a few months past the expiration date to help cover a shortage and they would still be effective. But the pens at this particular Walgreen location would have been expired beyond that length of time. On top of that, Smith said when Walgreens replaced her expired EpiPen, the replacement they gave her first expires in two months (instead of the normal period of about a year.) She had paid $145 out-of-pocket, with insurance, for the devices. "So you're planning to charge people full price for something that's going to expire in two months? Where is the accountability?" she said. Eventually, Smith got EpiPens that don't expire until next January, but she felt she had to fight for it, a fight she wants parents to know is happening. "I want parents to be aware, learning from experience, to check yourself the expiration date," said Smith.